Happy 20th anniversary to “Like Father Like Clown”! Original airdate 24 October 1991. Krusty’s emotional breakdown, animated beautifully by Brad Bird, is one of the funniest bits of character animation ever done on The Simpsons. There, I said it. Yeah, the way Krusty’s entire face scrunches up is brilliantly rendered. I was passing through Cleveland recently and visited the Maltz Museum of Jewish Heritage… I was happy to see several clips from this episode included in one of the exhibits. 5 PEPITO! The Biggest Cat In The Whole Wide World! uhh..Is it right to buy a Chrysler? 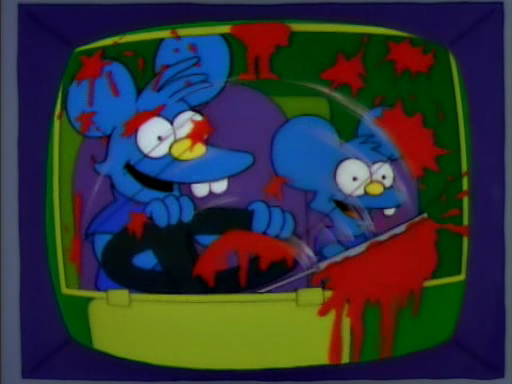 Here we are, 20 years beyond, and none of the subsequent episodes ever produced by The Simpsons ever surpassed this one in quality of Jew jokes. Family Guy came close some time back, though.